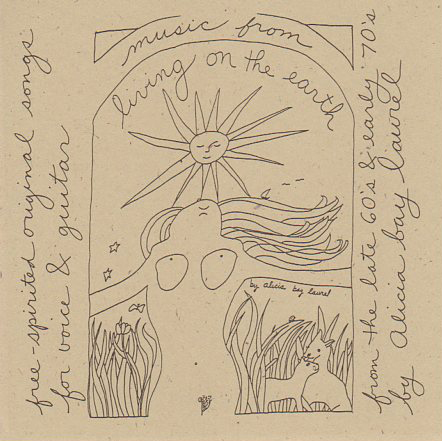 Posted on October 23, 2006 by Alicia Bay Laurel	in Blog. 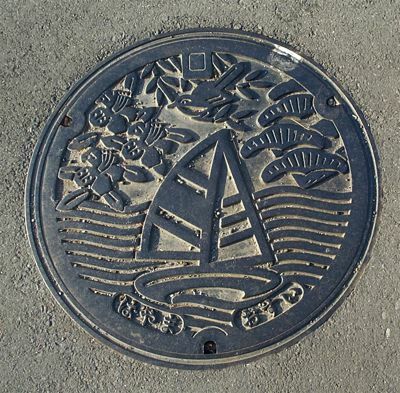 Kamakura’s municipal symbol on its man hole covers. 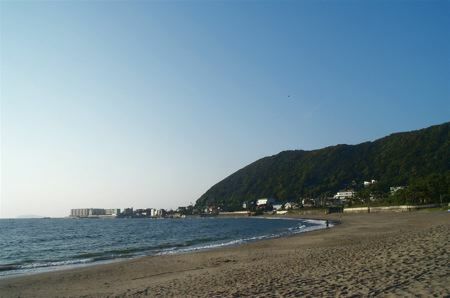 Hayama is a suburb of Kamakura, a famous beach resort town an hour by train from Tokyo. 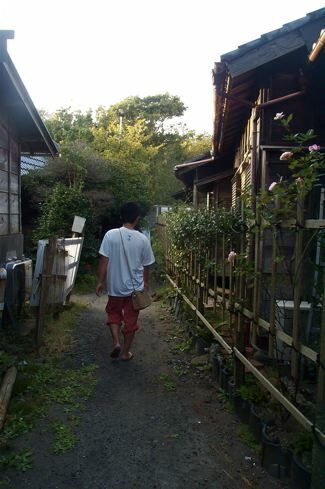 Koki Aso leads me down a back street in Hayama to the beautiful white sand beach where the Emperor’s family summer home stands. 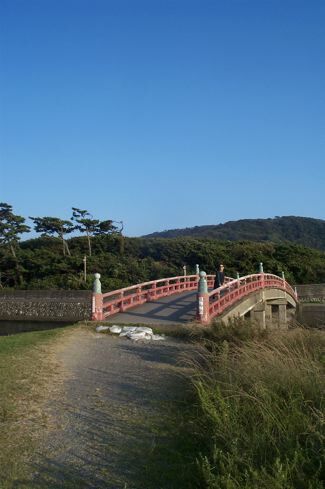 It’s an easy walk from Koki and Ayako’s house. The direct route is faster, but the back streets are more peaceful. The people who live there don’t own cars. They use the excellent public transportation and enjoy the quiet. Fancy that! 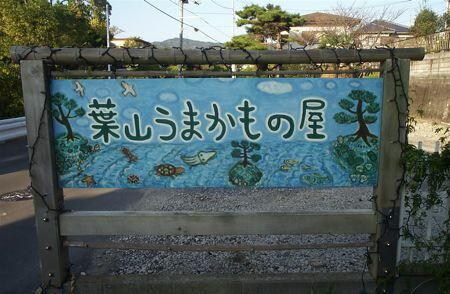 The back street fronts a river with ducks, egrets and many fish in it, and across the street from the river, I see a small natural foods store with a charming marine life mural on its sign. 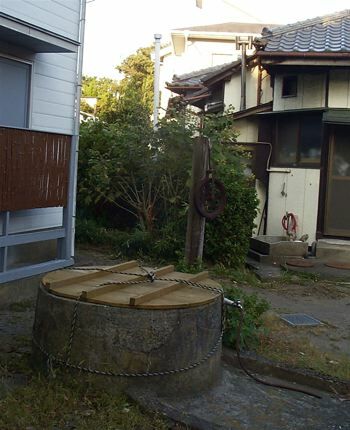 Further along the back street is a spring, evidently available to anyone wanting to fill a container with spring water. The beach, lovely as any in Hawaii, is practically deserted in the cool October breeze. 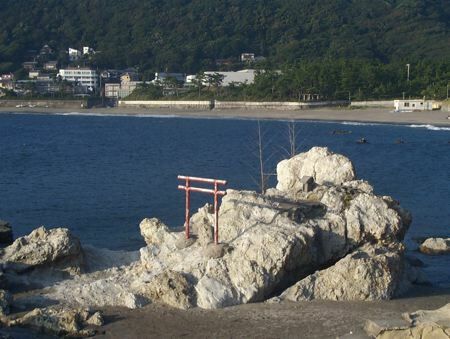 A Shinto shrine to an ocean god, complete with torii, stands on a rock in front of the Emporer’s summer home. I admire a forty year old bridge over the river. 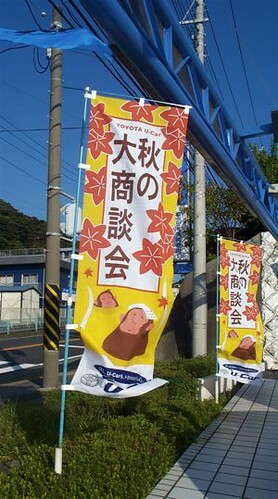 Near Koki’s house is a Toyota dealership with colorful flags. For reasons neither of us can fathom, they are decorated with images of monkeys soaking in hot springs. Until I saw these flags, I had no idea monkeys visited hot springs, but now I realize I have another inner animal with distinct desire; a monkey who loves to soak.